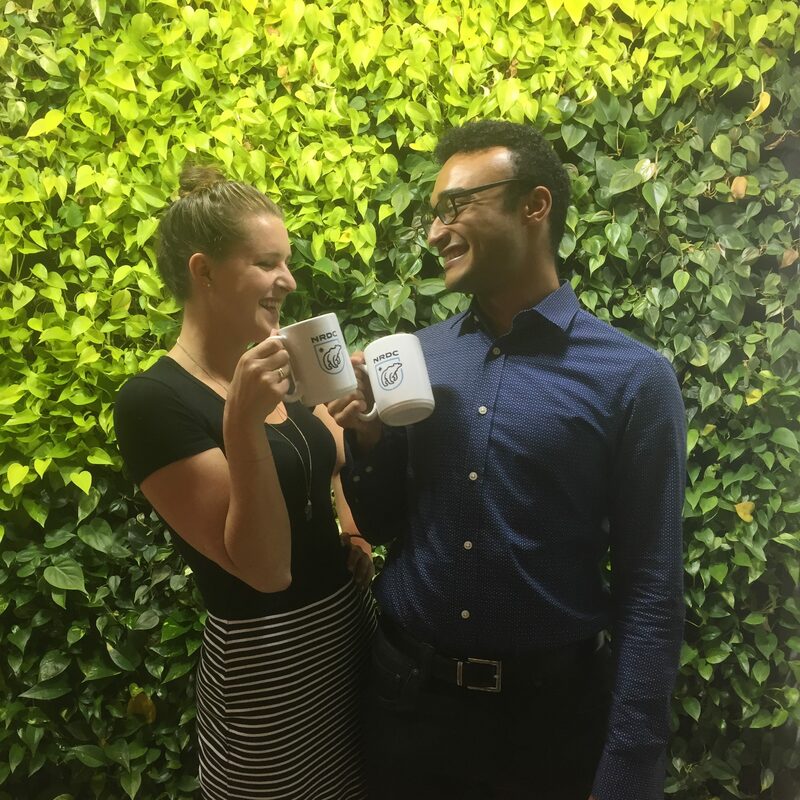 Land and Wildlife Legal Intern Kelsey and I enjoying a quick coffee break at the NRDC Green Wall, 2016. Before I began my internship with the Natural Resources Defense Council (NRDC), I had no prior experience with coal research. I owe tremendous thanks to professor Jen Phillips for encouraging all of us in Bard CEP’s spring Environmental Science course to research and present on a variety of topics throughout the semester. At first, it was daunting to process new information quickly and then teach others about the subject. But by the end of the semester, I had gained confidence. These skills allowed me to take on new projects throughout my internship and feel prepared. I therefore felt comfortable assisting a legal fellow in finding data to support his arguments about the implications of coal company bankruptcies on taxpayers and the environment. In addition, as the federal government looks to reshape its coal program, I contributed to NRDC scoping comments by evaluating the geospatial data types necessary for the government to adequately assess the program’s needs. One of my other long-term projects involved helping an attorney with research supporting his report on the Bureau of Land Management’s (BLM’s) failure to effectively oversee and manage oil and gas activities on public lands. This project opened my eyes to the bureaucracy of obtaining data from federal agencies. In short, my research objective was to create a series of graphs showing the trend of BLM oversight of oil and gas activities on federal lands. It has long been asserted that the BLM struggles to inspect every oil and gas well or lease, so it was my job to find the number of oil and gas inspections by BLM staff between 2005 and 2015 and compare those numbers to changes in BLM’s annual budget for inspections and oversight of oil and gas activities. The underlying assumption was that if the budget decreased, inspections decreased and vice versa. After an initial search, it became clear that the data would not be easy to find. Even a senior BLM official was not able to provide it to me directly, although he was quick to take my call and willing to answer my questions. So, I turned to the Freedom of Information Act (FOIA) process for obtaining data owned by the federal government. 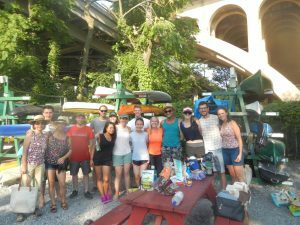 NRDC interns and I at the annual kayak trip, 2016. While I waited to receive the data from the FOIA office, I spent a couple of weeks trying to dig up whatever data I could find. I found myself skimming through a dozen of BLM’s 500+-page annual budget justifications documents when, to my surprise, I found precisely the data I had requested. With it, I created a spreadsheet of the actual number of oil and gas inspections that occurred from 2005 to 2015, including all the subcategories outlined in the budget document. Once I received the data from the FOIA office and compared the numbers, however, I identified a data discrepancy between what the BLM published online on their Oil & Gas Statistics page (which exactly matched what I found in their annual budget documents) and what the FOIA office data, which the senior BLM employee informed was accurate. Essentially, I discovered that BLM seemed to have overstated the number of inspections it performed in each year, or that the statistics they published online were the number of inspections they expected to perform, which is a bit deceptive. Either way, it was a tremendous experience digging into government documents and learning about how the BLM and other federal agencies operate. There are numerous procedures, and it can take awhile to obtain even a small amount of data. This process taught me to be patient yet persistent. While being patient, I found a creative solution that enabled me to make this discovery. These were only some of my research responsibilities at NRDC. I appreciated that my supervisor gave me the freedom to take on this investigative work at a deeper level and to have ownership over many aspects of the projects. It will be exciting to see the final report when it is published. I look forward to carrying these experiences with me into my career. Isaac is a graduate student at the Bard Center for Environmental Policy in New York, Class of 2017. He is the Research and Policy Intern for the Natural Resources Defense Council's Land & Wildlife Program in Washington, DC. He assists with research and policy analysis surrounding fossil fuel extraction issues that impact humans, wildlife, and the environment. He researches primarily on fossil fuel development on federal lands. 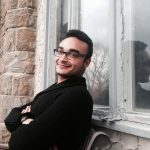 Isaac, this is such a great story about data access, about assumptions and realities, and about the work needed to really uncover the truth – especially in our age of “fake news”. Maybe investigative reporter is your calling!